Heavy Auto Hangar Door can horizontally move between the top and bottom tracks. There are single, double and multi panels, which can be installed indoor or outdoor according to the actual surroundings. 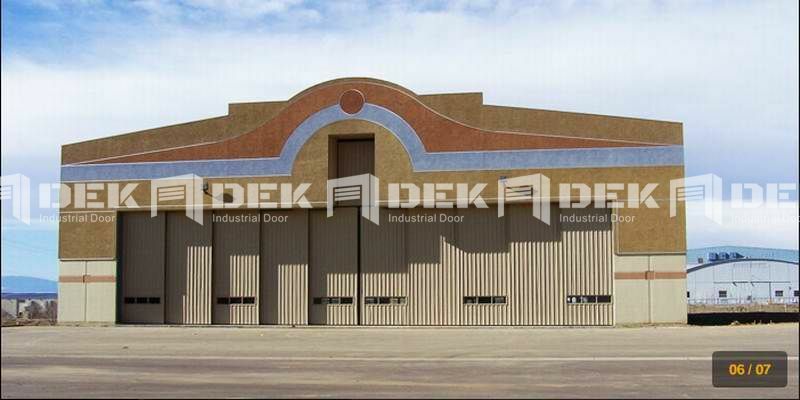 Hangar Door has various forms, specifications and panels. 4. Windows can choose toughened glass, sunshine plate, PC endurance plate, laminated glass and so on. 1. Can realize intuitive detection and electric control. 2. Lower load-bearing,and the guides installed on the top. 3. Various structures,single track, multiple track for track type,the door could be double leaves / multiple leaves. 4. The moving mode have one side,bilateral,interworking moving. 5. The door can realize single and centralized control. 6. The door is designed with limit-protection and air-defense protection when opening or closing the door. 7. The design concept: independent research and development, as per customersrequirement,and the standards and norms of the Chinese industry. 1. External dimensions: according to user requirements. 2. Power supply: according to national standard in the power supply. 4. Each door weight: according to the design. 5. Door leaves quantity: according to the design. 6. Wind load: the load is adjusted and restrict by load code. 7. Control system: centralized control, individually controlled are combination. 8. Sound system: more than 40dB. 10. Lighting area: based on user requirements.